There’s a New Moon coming up this Friday, April 5, 2019 at 4:50 AM Eastern US time. This New Moon takes place in the day and hour of Jupiter; and moreover, when the chart is cast for Washington, DC, we find that Jupiter is both the highest of the major planets, the ruler of the chart’s Midheaven, and the co-ruler (along with Neptune) of the three Pisces planets in the First House. What does all this mean? Jupiter is the ruler of excess, abundance, and expansion. And because the King of the Gods is in his home sign of Sagittarius, in Fire, all this year — when he is hot, he is very, very hot. Because he is so prominent under this New Moon, we can expect that events will be dramatic, larger-than-life . . . and that we’ll feel the “new beginnings” energy associated with a New Moon, not only in the Aries-ruled House of our chart (i.e. where the New Moon lands), but in the Houses where our Pisces and Sagittarius planets live, too. In my case, I’m looking out for change and stimulation in my Second House (where the New Moon degree of 15 Aries falls in my natal chart), my Tenth and Eleventh Houses (which are both ruled by Sagittarius in my natal chart), and my First House (where my Pisces Moon hangs out). For the next week or so — three or four days before and after Friday’s New Moon — I’ll expect activity around First House, Second House, Tenth House, and Eleventh House-ruled matters in my life. How about you? Take a quick look at your own chart. Where do Aries, Sagittarius, and Pisces land for you? Which areas of YOUR life will be moving and shaking this week? But of course, in addition to influencing our individual lives, astrology can also show us what’s happening on a macro level. This chart promises some major world events; it is a fated time, particularly for the United States. The Ascendant in the New Moon chart (when cast for Washington, DC) is conjunct the natal Moon of the United States. Meanwhile, the karmic heavy-hitters Pluto and Saturn are straddling the South Node of Loss, all conjunct in Capricorn — while Eris, Goddess of Discord, and Pallas Athena, the Goddess of War, both square them. 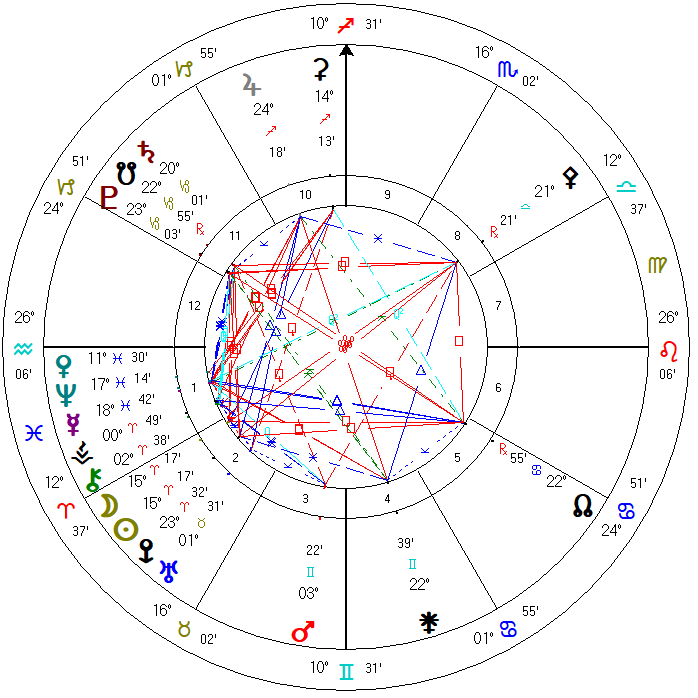 Just before Friday’s New Moon, Pluto actually dips into the South Node of Fate for the first time since August 2002. This is a big releasing event, often relating to the integrity of the earth: earthquakes, volcanic eruptions, etc. All of this to say: we can expect some notable and challenging events in the news. The chart, with dwarf planet Ceres, the Mother Goddess, at the top, brings up stories around the love and loss of daughters. Venus, the Divine Feminine, is on the Part of Catastrophe, while Vesta, the Goddess of the Hearth, has just entered the aggressive sign of Aries. She’s on the World Axis now, revving up to start another whirl around the signs. It’s a good time to revisit the myth of Demeter (the Greek name for Ceres) and her daughter Persephone, and watch for Angry Feminine energy stepping forward into the public arena. It’s a chart that makes me think of MADD, the Mothers of the Plaza de Mayo, and the sculpture Dark Elegy by Suse Lowenstein. This is a powerful New Moon, sweeping in the initiation energy of spring. I’d urge you to make the most of it: take some time to commune with like-minded friends, light a candle, and meditate on your next quest.